Normal hand-held tweezers for soldering are most useful if they consist of 8 inches of good, solid metal. 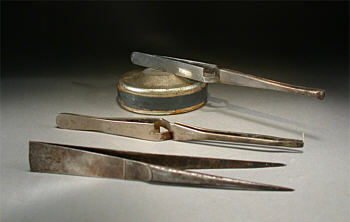 My favorite pair are stainless steel bench tweezers from Germany. It might be noted that the Indian style soldering tweezeris excellent; it has a heavy, thick end to grip during use so your fingers don’t get hot. One of my favorite tweezer tricks is done using a wide-jawed self-locking tweezer-the type that is normally chrome plated. You can alter this tool to pick up earring posts from a flat surface at a 90o angle. There is no skill required to snap the posts into place in the tweezer jaws, making production soldering of earrings much faster and more efficient. To create this tool, open the ends of the tweezers and file a groove into each side of the jaw with a triangular needle file. Start close to the end of the tweezer. The grooves must be in the same location on both sides so they line up with each other. Also, the grooves should not be too deep-no more than 0.5 mm, and even that is probably a bit too deep. Once the grooves are made, file the outside of the jaws. Form a beveled front end that slopes down toward the very top edge of the grooves. With the ends filed at such an angle, they can smoothly grasp an earring post lying on a flat surface and guide it into the groove in the tweezer ends. You can then use the post to pick up a solder chip, melt the solder onto the post, and solder it to the earring back. To use these types of tweezers as soldering jigs, position them on a large, strong magnet on your soldering bench: Just clamp the backs of the tweezers to the magnet at a useful angle. I found the perfect magnet for this purpose inside an old stereo speaker unit. Just drill out the mounting spots attaching the magnet to the frame (while wearing safety equipment), and you have a great platform for your tweezers.